Stems: Usually prostrate or decumbent, sometimes weakly ascending, much-branched, strigose. Leaves: Alternate, odd-pinnately compound; petiole .12 to .4 inch; stipules .08 to .16 inch; leaflets 3; leaflet blade obovate to elliptic or oblong, .3 to .85 inch long, .2 to .6 inch wide, base rounded to truncate, apex rounded to acute, mucronate, margins entire, surfaces strigose or adaxial glabrous. Inflorescences: Racemes, spherical to cylindric, 4-8(-12)-flowered, much longer than subtending leaves. Flowers: Chasmogamous flowers papilionaceous: calyx campanulate, .12 to .24 inch, shorter than fruit; corolla .2 to .28 inch, pink to purple, banner with dark purple base; petals 5; wings as long as or slightly longer than keel; stamens 10, diadelphous. Cleistogamous flowers: sepals 1/4 to 1/3 as long as fruits. Fruits: Legumes, elliptic to ovate, .16 to .24 inch, strongly flattened in cross section, enclosed in or prominently larger than persistent calyx; seeds olive to brown, reniform to elliptic, .08 to .12 inch, somewhat flattened, smooth. 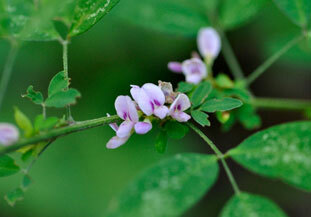 Comments: Lespedeza is a misspelling of the name Cespedes and repens, creeping. V. M. de Cespedes was a Spanish governor of Florida.